This was in the exhibition Unterströmungen (Undercurrents) at Galerie Bagnato in Oberdorf, Konstanz Germany September 2014. Both channels play the same imagery, but not simultaneously. The primary visual thread through this work is image the movement of electrical wires. These are layered with images of water. The sounds are gathered from the streets of New York City, the shores of lake superior, and text from dreams I read where water (in one form or another) is mentioned. There are 60o individual paper and steel ” bricks” which are not attached to each other. Finally, in Felicia Glidden’s videos, the different translation methods of dreams converges and creates a work of art of spoken text, music, cinematic images of dream events, as well as natural and ambient noises. This is combined with some complex room installations. The result is not a replica of the dream, but the dream analogous sphere, as shown in the video “Between Two Rivers III” – the recording of a multimedia installation. Here the media used, which is continually broken up by the architecture itself, accompanies, comments on and contradicts each other. It creates an open connecting room for associations. 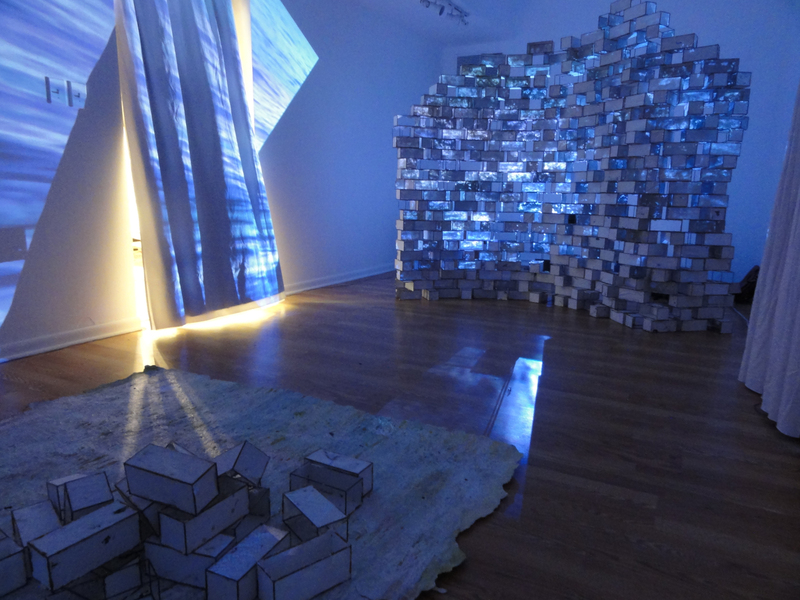 In One and a half years of work, Felicia Glidden has created a wall for film projections. It consists of hundreds of cubes. Each is made of a metal skeleton which has been coated with hand-made paper. These cubes are now arranged in different formations – atop and next to each other, some of them are open. This wall acts as a breakwater for the film projected on it, which shows water surfaces, because water is in the dream sequence as described by the voice. The video “Between Two Rivers II” becomes the mosaic – ethereal because it denies the clear sense of tracking. Felicia Glidden operates an artistic research, but it is not a dream interpretation that precisely robs the semi-conscious their essence. In Felicia Glidden’s art the tangible elements made of dreams retain their aura – the schemes of an immeasurable dark zone, with which they are associated. Felicia: (voice over) Lying on a piece of paper on top of the water. F: They are digging with a back hoe. There is a bank of water next to the garage. F: I splash my hands into it to get some of it to drain. F: I swim in the slush water. F: I am wondering how I will get the oil out. F: Why have I returned three times when my first escape was clean away? F: The view is from above. F: I see rice patties floating. They are divided into squares. Still floating, but separated into squares, near the shore. F: Bubbling up rapidly. I ask if we have gotten the drain, apparently we had partially removed it. F: Another scene I am swimming freely in the water. Swimming which feels like flying. Don‘t take up too much space as it‘a already tight enough. F: I find the room again, but enter from a different door. F: Soon I am trapped in a corner trying to be small. F: A man goes up to the edge of the ice and acts like he‘s holding it. Suddenly he‘s in the water, and the water is everywhere. F: There is a half door. A black woman walks up to me and starts talking song lyrics to me. I can‘t remember the song but rather the meaning. I tried to stop her, but she went on to finish the entire lyric. F: We get to the dock and there is a busy restaurant. F: I am impatient as I try to fix the boat motor. Low pulse from bells resonating. Ravelation is an original work inspired by Ravel, composed and performed by Alain Wozniak in the Galerie Bagnato for Kunstnacht Konstanz in September 2014 at the solo exhibition Unterströmungen by Felicia Glidden. The second exhibition of Between Two Rivers was at Montgomery College in Maryland for an artist in residency in 2012, curated by Judy Stone. Students were invited to participate by adding their dreams Using japanese paper, glue and markers, and then rebuild the structure in one area of the sculpture. I also recorded some of them telling their dreams and each day of the residency, I would add their voices to an mp3 player attached to headphones. In the three week residency I saw 16 classes of art students. The installation had three separate video projections with one stereo sound 29:00 Minutes. There are 600 individual “bricks” in the exhibition. The two visual threads in the videos are clouds and roads. Solo exhibition at Hillyer Art Space in Washington DC. The visual thread through this work is an video taken from an airplane above the clouds over Switzerland. The dreams included in the sound score are all recorded in my 2012 journal. The shadow drawings on the wall were an integral part of the installation. On the floor lies a 2 meter (6 ft) square handmade sheet of paper on which sits a chaotically stacked pile of “bricks” (paper and steel) There are 350 individual “bricks” (19 x 8 x 9 cm) (7.5 x 3.35 x 3.5 in.) in the exhibition. This video clip includes sound from the Friedrichshafen Youth Wind Orchestra tuning, as well as an original composition on piano by Christian Von Der Goltz, 2010. This was a test piece which was never fully realized. I had envisioned floating a paper house about a foot above the ground from an impossibly small wire crane which was on the edge of breaking.